In Steve’s words: Steve’s Original is the funding source for my true calling: Steve’s Club. I’m trying to change the lives of local inner-city kids with fitness training and peer mentoring. My not-for-profit club is for kids from Camden, NJ—touted as the most dangerous crime-infested city in the country. Many of these kids were drugging and ganging before they were hanging out with me. They just needed an alternative. 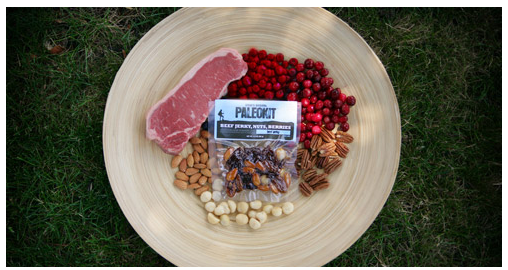 A delicious mix of free-range jerky, raw macadamias, almonds, pecans and dried fruits, PaleoKits are gluten-free and perfect for people on the go. Vacuum packed for maximum freshness, PaleoKits have a six-month shelf life and are great on-the-go fuel for life’s journey. PaleoKits are available in a small size for snacking and large size for meal replacement. Following Zone®? A small contains two blocks of protein, carbs and fat and a large contains 4 blocks of each. To view nutrition information, please click here (PDF). Some of our favorites include the Original Paleokit (made with jerky, nuts, and berries, the Paleokit is perfect for a meal replacement or just a quick snack), the Grass-Fed Paleostix (Grass-fed Paleo Stix are perfect for people on the go and are vacuum packed for maximum freshness) and Berky (Made just for kids, Berky (berries and beef jerky) is the perfect snack for young Paleo-eaters). 2 Pings/Trackbacks for "Steve’s Original Paleokit"